Many Canadians believe they’re insured against flooding caused by overflow or storm surge from a body of water such as a creek, river, lake or an ocean. But they’re not. Comprehensive Water covers your home against sudden and accidental water damage. Whether it enters your home through a sewer or septic back-up, extreme weather, storm surge, waves caused by a storm or hurricane, or even flood, you’re protected. * Learn more about the trends that make water damage insurance necessary. This carousel describes the four ways water can get into your home. The first panel illustrates overflow from a body of water, the second panel illustrates a sewer/water backup, the third panel illustrates extreme rain, the forth panel illustrates storm surge/waves from storm or hurricane. 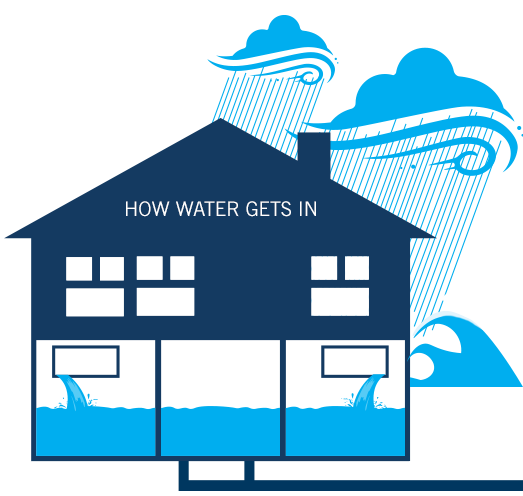 The risk for water-related damage is different for everyone and depends on where you live and the characteristics of your home. Know your risk by taking the online assessment. PROTECT YOUR HOME from extreme weather On average, extreme weather has cost Canadians over $1 billion per year in insured losses since 2008. In fact, water-related events like flooding are now the most common type of natural disaster in Canada.